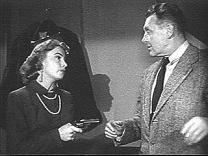 The Man was gumshoe Mike Barnett (Ralph Bellamy). Set in New York City, Barnett was a loner who used his brains and his fists to solve crimes. In the final season in 1956, Frank Lovejoy played the title role. Sold as a 5-DVD-R or VHS set.